AQRA President’s Derby winner Unregulated Cash is entered in Sunday’s 350-yard, $20,805 Desert Classic Derby at Turf Paradise. PHOENIX, AZ—NOVEMBER 2, 2018—Unregulated Cash, a gelded son of Favorite Cartel owned and trained by Jose Botello, is one of 10 3-year-olds entered in Sunday’s 350-yard, $20,805 Desert Classic Derby at Turf Paradise. 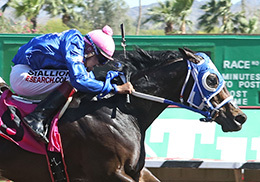 Unregulated Cash will be making his first official start since April 7, when the gelding scored a half-length victory as the 13-10 favorite in the 350-yard AQRA President’s Derby at Turf Paradise. He has won four of his 11 starts, including both of his races at Turf Paradise, and he has banked $30,888. Unregulated Cash drew post 3 and will be ridden by Martin Osuna.